Stock selection, trade and portfolio management are numbers games. Try not to think about stock picking, broker advice, fundamental analysis, all of which may have a place in people minds but that’s not what we do so lets for a moment just be singularly focused on one defined strategy that achieves an objective. The numbers give a somewhat predictable outcome if we are true to the repetitive processes we set out. Many of us find it hard to make the jump and blindly follow a ‘single focus’ process when we are distracted by other things such as media noise. We need to close that door to focus clearly, especially as it not a part of our decision making process. The current market is a classic example of the worry that can distract our focus and with that goes a weak market index to exacerbate concerns. But that doesn’t have to roll into our methodology. In fact it is exactly why we have such a methodology to remove the dark cloud effect it can over our trading. We should be able to trade with confidence and enjoy it. If our method is effective then why should we worry? If opportunities are there we must take them and not let fear control or override us. Our strategy is a very ‘safe’ two-step process: Firstly, 3 Setups are used to enter a trade (trend and key low reversal, and new highs), and once in the trade it becomes purely a function of our money management technique. This means always keeping losses small and running trend moves hard like QAN and ALL below. 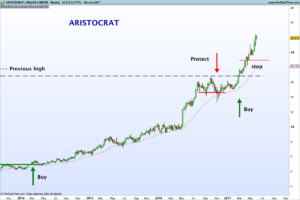 Both these stocks required two trades to capitalise on this run and that’s a part of the Stockradar strategy – protect and re-enter if necessary. 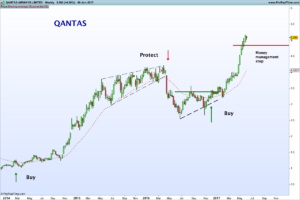 The stop was implemented to protect against further falls but both stocks are good examples of how Stockradar works and is always able to capitalise on big trend moves such as we have seen in these stocks like QAN or ALL. The key to making the numbers approach work is managing your risk. If your risk is managed properly you have no reason to worry. It is that simple. The underpinning premise of our risk management policy is you don’t take big losses. Here it is important to remain in control. This control is twofold. Firstly it means controlling your emotions by not letting them play a part in the decision-making process and secondly, to make sure you have the control and discipline to follow the procedures set out correctly. Quality in quality out! This quality is the method or trade plan that is devised to capitalise on a market edge but every action is bound by controlling of risk. Expectations of what can be achieved must be controlled. Falling stocks dominated the 2007/08 and 2010/11 periods so realistically when we look at the home page chart of Stockradar returns on the conservative portfolio you should be elated because you didn’t lose any money. 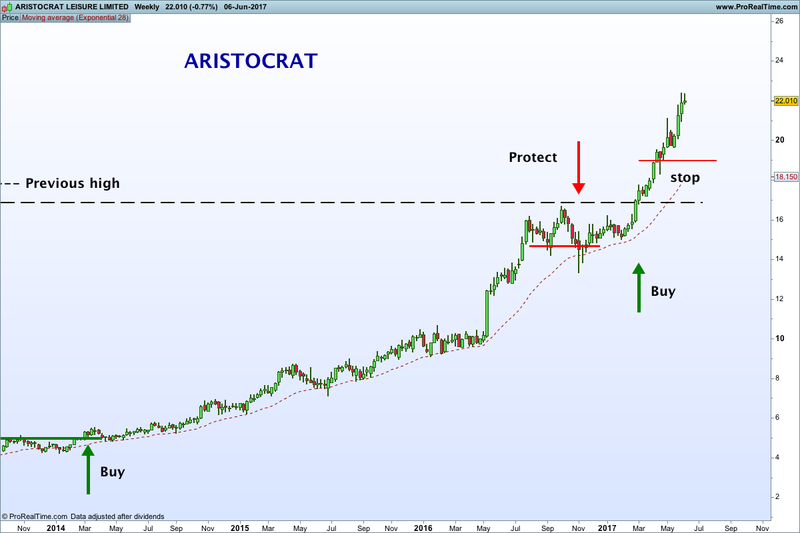 That is a great outcome during the period for sometimes the market simply will not deliver what you want making returns hard to come by but we also need to recognise that. That’s when the smart thing to do is nothing and it is unlikely that Stockradar will receive many entry signals during those periods. This is a part of the ‘trade plan’ controlling risk, which was especially heightened during those periods. That’s hard and so we won’t promise what we can’t deliver as we can’t make Mr.Market do what it doesn’t want to. Patience and adherence to the procedures must override your forebodings. The proof is in the outcome. Because of the ‘baggage’ we can carry we sometimes have problems seeing the ‘truth’ when it is right in front of our eyes. The results shown on the Stockradar home page clearly show a steady trend up in equity. It is a long-term profile that has built by the numbers over 14 years. This approach endured the bull of 2003/06 the bear of 2007/08 and the bull of 2012/15. This is generated from a very simplified stock group of 20 diverse leading stocks that have all existed for 14 years. It looks very positive but you still would have undergone a 2-year period of no gains during 2007/08. That may sound hard and if you lived through that period it may have been frustrating, but it is reality for us. 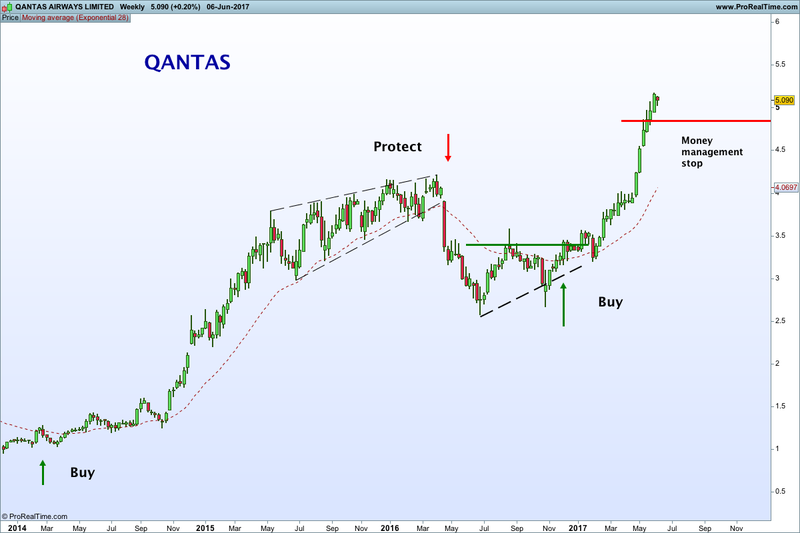 As a point of interest and just to prove how wrong our ‘thinking’ can be roll your minds back to 2013 when Qantas was thought of as a market pariah. Look at me now! One year earlier Aristocrat was a real stinker with little prospects. Look at me now! The numbers proved us all wrong then and will continue to do so as they still generate great returns based on our strategy. Despite the changes that occur within the stock markets the underlying rotating effects of cycles and sentiment don’t. So today is no different to 10, 20, 50 or 100 years ago. We should move ahead confidently with what we know, not what we think. The proof ultimately is in the outcome.